Composer and Sound Artist Howard Sandroff is inarguably one of the most celebrated artists among the distinguished Columbia College Chicago faculty. His musical compositions are performed, recorded, published and broadcast throughout the world and have been featured at international festivals including The Aspen Music Festival, The International Association for Electronic Arts, The International Computer Music Conference, The Bejing MusicAcoustica Festival, the Musik Factory in Bergen, the Ultima Festival in Oslo, Norway, the M-Cluster festival at the Berlin Academy of Art, and many others. Howard’s influence is pervasive throughout the College. His first appointment in 1978 as a member of the Adjunct Faculty inaugurated the study of Musical Acoustics in the Science Department, in the mid 1980’s he created the first sound curriculum in the Film Department, now the Department of Cinema Arts and Sciences and is probably the first Columbia faculty member to include computer applications in media in a sound design course for film. 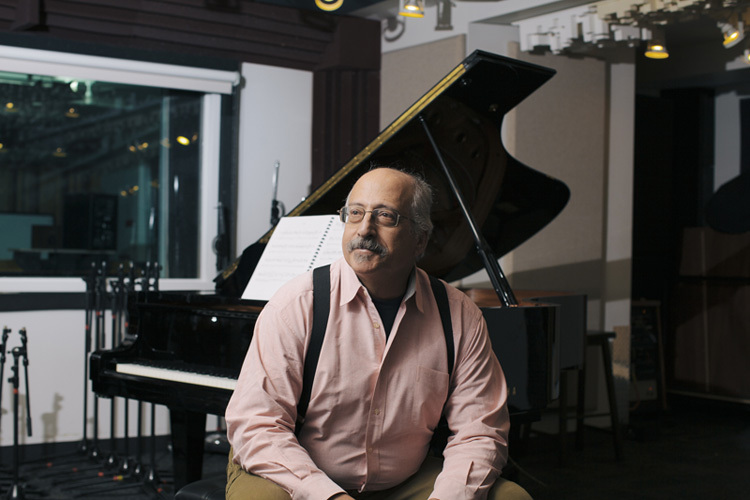 In the 90’s at the urging of the music chair, William Russo, Sandroff authored and designed the first music courses in Electro-Acoustic Music, Synthesis Programming and Composition. Then, along with Doug Jones, Associate Professor Emeritus of Acoustics, authored the first complete curriculum in sound production and acoustics. That curriculum eventually became the Department of Audio Arts & Acoustics where he serves as Professor of Sound Art. Sandroff’s work has not only taken him to music festivals worldwide, he has been a guest composer at some of the most prestigious institutions in the country and beyond including, The Julliard School, Stanford University, Northwestern University, the Manhattan School of Music, Catholic University of America, Bennington College, State University of New York in Albany, Rennsilear Polytechnic Institute, Queens College of the City University of New York, The University of Texas, Kunitachi College of Music, Japan, the Institut de Recherche et Coordination Acoustique/Musique (I.R.C.A.M. ), Clark University, the Oberlin Conservatory of Music, The University of Wisconsin, Colgate University and others. He has appeared as Sound Artist with the Santa Fe Opera, the Chicago Symphony Chamber Series, the Ojai Festival, I.S.C.M. Boston, Contempo of The University of Chicago and many others and has collaborated with visionaries like Pierre Boulez and Morton Subotnick . His most recent contribution to the Colleges offerings is his work on the newly approved Bachelor of Science in Music Technology. Sandroff co-chaired the Music Technology Task Force along with Associate Provost Insook Choi, which for the last two years worked to create an innovative and ground breaking interdisciplinary degree across three departments and two schools. Ever vigilant to expand his creative output, Sandroff began sculpting in welded steel in the early 2000’s. That work has progressed to the creation of sculptural percussion, objects that are played and processed by computer. Along with colleague Ben Sutherland, percussionist and composer, they have created multi-channel, inter-active sound compositions. Sutherland performs on the steel sound sculpture while Sandroff controls an interactive computer program that processes and redistributes the sounds through loudspeakers, which surround the audience. Their performances opened the 2012 and 13 exhibits on the art and career of Howard Sandroff presented by both the Columbia College Library and the Regenstein Library at The University of Chicago respectively. Sandroff and Sutherland have proposed their performance for the upcoming (August 2015) All College Faculty Forum. As Sandroff and his colleagues across the campus explore all the media and artistic interactions possible using the newest information technology, the college is grateful for faculty that cross the generations as well as the boundaries of artistic pursuit.